Vida Glow believe in the importance of holistic wellness, that goes beyond a one dimensional approach to beauty. Beginning with a range of pure yet powerful supplements and expanding into skincare in 2018, Vida Glow delivers a beauty experience that focuses on all layers of the skin. Vida Glow initially focussed on offering marine collagen only, an ingredient that has become a key part of the entire range. Founder Anna Lahey discovered its potential health and skin benefits while on holidays in Japan, seeing collagen supplements available in pharmacies, supermarkets, gyms and even restaurants. She began taking it daily, seeing a dramatic increase in the health and vitality of her hair, skin and nails. 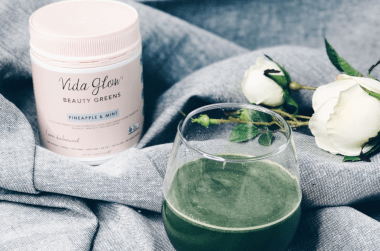 After seeing the benefits Marine Collagen was having for their customers, Vida Glow was motivated to expand their range to offer a more holistic approach to beauty and wellness, by harnessing the goodness of real food. With a range of collagen supplements, beauty powders designed to treat and target different concerns, as well as a skincare range, Vida Glow delivers a well-rounded selection to benefit health and beauty. Collagen is an important protein that makes up the majority of the skin and ligaments, collagen is naturally produced by the body. As we age, the amount naturally produced starts to decrease, affecting skin elasticity and hair fullness. Vida Glow’s collagen supplement range uses Marine Collagen derived from the scales of the Deep Sea Red Snapper. Marine Collagen works from within to deliver essential micronutrients to the collagen matrix below the skin, and helps to boost the body’s natural ability to produce it. With a low molecular weight, Vida Glow’s Marine Collagen is highly bio-available. All Vida Glow products are 100% natural, and free from gluten, dairy, parabens and are non-GMO. Vida Glow is available only for shipping within Australia. Definitely not tasteless but results are amazing! I'm 26 and starting to see fine lines and wrinkles on my forehead, after doing some research I decided to buy the Vida Glow Marine Collagen. I've been taking one a day for a few weeks now and I am OBSESSED with the results. My skin is bright, clear, plump and while the fine lines and wrinkles are still there, they don't look as obvious as before. It's definitely not tasteless, there's always that slight fishy taste (similar to taking a fish oil tablet) but it's not bad, I find mixing it with juice minimises the taste the most. I'm onto my second tub of this powder - I think the taste is good, and it mixes well with water quite easily. I noticed an improvement in my skin health, and it's great to have the added protein in my routine. The tub is also really large compared to other brands - really good cost per use I think! I will keep purchasing for sure.